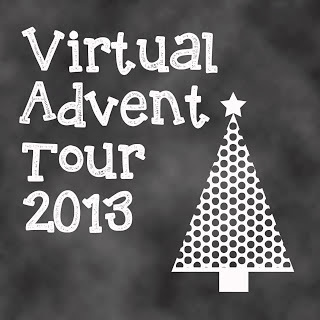 I'm so pleased to be participating in the Virtual Advent Tour yet again. This year I have decided to ramble about the kind of TV I'm taking in right now...TV Christmas movies! I watch a load of these every year and to be honest a lot of them are terrible. I have almost no tolerance for the ones that pretend Santa Claus is real. I never believed in Santa Claus so maybe I just don't get those? It's even worse when Santa Claus's son is falling in love or whatever. Or his daughter. Just...no. But I do have a soft spot for holiday romances. Just like the holiday romance novellas I've always enjoyed reading, these bring that special warm feeling. And since romantic comedies are pretty much nonexistent in the movie theaters it's always nice to find a real charmer. There's just something about Christmas that is romantic in nature and romances lend themselves very well to Christmas stories because of the individual character growth that must take place in order for hero and heroine to wind up together. So! I watch the movies Lifetime and Hallmark churn out every year. So much depends on the casting. For instance, last year Hallmark had Love at the Thanksgiving Day Parade, which might have been awful, but I was too blinded by how cute Autumn Reaser was and how cute her vintage wardrobe was to care! I found something similar this year with Lifetime's 12 Trees of Christmas...the lead actress was so adorable! But this was also the perfect Christmas movie for book lovers because it was all about saving a library! It reminded me a little bit of You've Got Mail to be honest, with the antagonism between the leads stemming from their professional careers and the dialogue wasn't bad! It actually made me laugh at times. A real delight. I also enjoyed Fir Crazy on Hallmark. Again, a really cute cast with all the right sweet moments and just enough humor to survive. What are some of your favorites? Do you watch? Do you like Christmas romances? Do tell all!